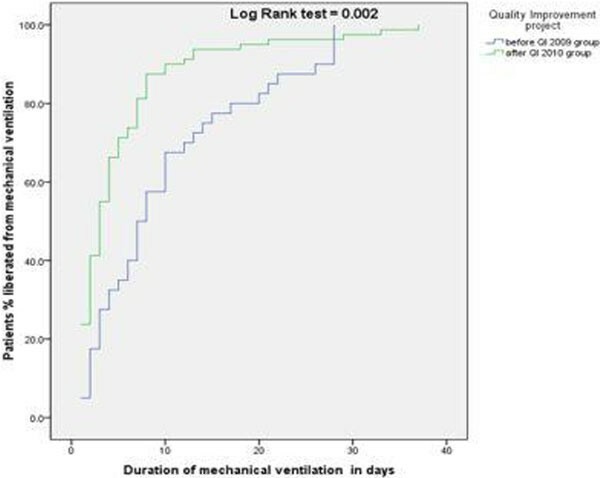 A protocol that paired spontaneous awakening trials (SAT) and spontaneous breathing trials (SBT) decreased duration of mechanical ventilation (DMV), ICU length of stay (LOS) and mortality . We studied the efficacy of multifaceted implementation strategies (MIS) of an evidenced-based protocol at a tertiary academic center. This was a prospective observational cohort study with historical control. The cohort consisted of consecutive patients who were extubated at least once during the ICU stay. The intervention was MIS of a quality improvement (QI) protocol pairing SAT and SBT. These strategies included: preprinted daily order sheets, structured daily multidisciplinary rounds, QI monitoring and regular feedback to the ICU staff. The outcomes: DMV, ICU LOS, reintubation and hospital mortality. Chi-square and t tests, adjusted logistic and Cox regressions were used. Total patients n = 120 (2009, n = 40; 2010, n = 80). The baseline characteristics were imbalance for age and APACHE II. The 2010 group (after QI) had less DMV, ICU LOS and hospital mortality (Table 1). The adjusted hazard ratio in reducing time to extubation = 0.57 (95% CI = 0.37 to 0.88) and adjusted odds ratio for hospital mortality = 0.27 (95% CI = 0.12 to 0.67) in the 2010 group. See Figure 1. Time to extubation KM curve. MIS of a paired SAT and SBT protocol reduced duration of MV, ICU LOS and hospital mortality.